Reus, 28, has been out since suffering the injury in last May's German Cup final, when Dortmund beat Eintracht Frankfurt in the Berlin showcase. 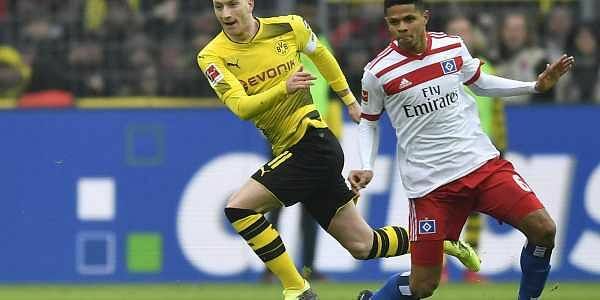 Dortmund's Marco Reus, left, and Hamburg's Douglas Santos challenge for the ball during the German Bundesliga soccer match between Borussia Dortmund and Hamburger SV in Dortmund, Germany, Saturday, Feb. 10, 2018. BERLIN: Injury-prone Germany winger Marco Reus returned for Borussia Dortmund on Saturday against Bundesliga strugglers Hamburg having been sidelined for the last 259 days by a torn cruciate knee ligament. On Saturday, Reus led out the home team at Dortmund's Signal Iduna Park stadium. He started as an attacking midfielder behind Belgium striker Michy Batshuayi, who is on loan from Chelsea and scored twice on his Dortmund debut a week ago. Four months before the World Cup kicks off in Russia, Reus needs to stay fit. A string of injuries have restricted him to 29 international appearances and nine goals for Germany after twice being the victim of desperately bad luck. An ankle injury suffered in the final warm-up game before the 2014 World Cup in Brazil ruled the playmaker out of Germany's title-winning squad. He then missed the finals of Euro 2016 with a persistent groin injury.